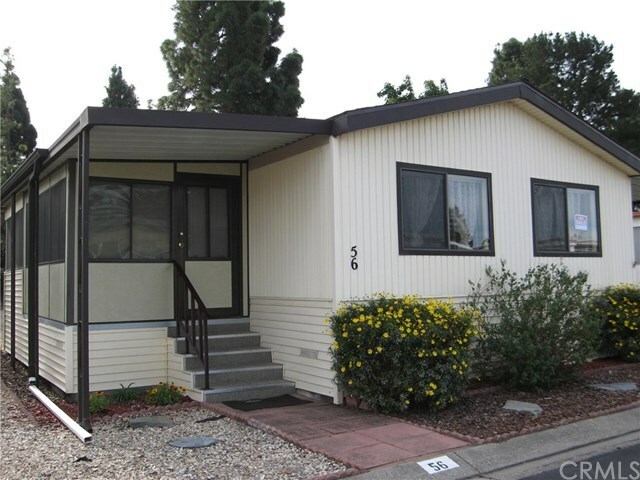 This well-maintained two bedroom, two bath home is ready for you to move right in. Located in popular Rancho San Luis Mobile Estates, this comfortable home features an open floor plan, vaulted ceilings, skylights, plush carpeting, dual-pane windows, a newer roof and an upgraded kitchen with newer appliances. A special feature of this home is the enclosed porch that can be used as a den, office or exercise room. The spacious back yard has two sheds, a fenced area for your pet and plenty of room for gardening and back yard entertaining. Rancho San Luis offers a clubhouse, pool, spa and RV parking. Directions: Rancho San Luis Mobile Estates is located at the corner of Prado and S. Higuera. Once inside the park, take a right onto the first street to #56 on the right hand side.